As is our usual practice, we show the regular retail price of the items. If you order using our secure order form page (click on the “order” link at the end of this column) we will write back right away and acknowledge the order. We’ll put your credit card receipt in the package, of course, showing the 20% off discount and shipping charges. Or an invoice if you’d rather have us bill you so you can pay be check later. Whatever works for you. We invite you to tell us if you’d like the slowest, cheapest “media mail” rate (that, for a small order, is something like $2.75) or the quicker Priority Mail (which is still cheaper, and yet often quicker, than UPS.) For a smallish order of a few books that is often $6.95. Since some of these may be needed within a week, you may want to opt for Priority Mail, but we’ll do whatever you request. 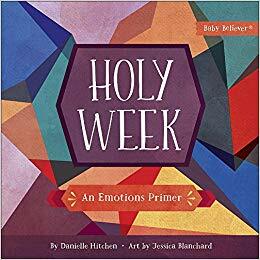 Holy Week: An Emotions Primer Danielle Hitchen art by Jessica Blanchard (Harvest House) $12.99 I have rarely been so glad, and frankly surprised, by a board book; this new one called Holy Week is part of a several book series called “Baby Believer.” Maybe that sounds a little corny to your liturgical ears, but these are wonderful books for infants (and maybe up to 4 or 5 years old or so.) Each one has Bible episode or verse, linked to something that is also being taught. For instance, Let There Be Light has the subtitle An Opposites Primer. First Bible Basics is called A Counting Primer; we love the one called From Eden to Bethlehem: An Animals Primer. There is even one called Psalms of Praise: A Movement Primer. 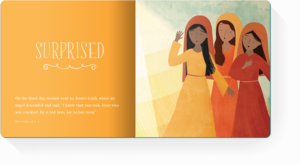 We have shown this to several customers in the shop and everyone is very impressed; there is nothing cheesy or simplistic about this, and it doesn’t say to much, allowing the child to ponder the Bible text and the art and the emotion. Gladly, Jesus is not portrayed as as European white guy, either, a touch we appreciate. Danielle Hitchens and Jessica Blanchard have started what they call Catechesis Books. The artist, by the way, is a graduate of James Madison University and also studied at the Corcoran College of Art and Design. 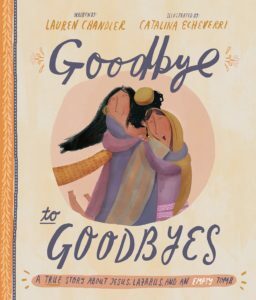 Goodbye to Goodbyes: A True Story About Jesus, Lazarus, and an Empty Tomb Lauren Chandler, illustrated by Catalina Echeverri (The Good Book Company) $14.99 We have highlighted each of the books in this great series, too, and we rejoice that there is a new one, perfect as an Easter gift for young ones ages up to middle elementary ages. Goodbye to Goodbyes is part of a series called “Tales That Tell the Truth” and we love them all. I hope you recall A Christmas Promise or The One O’Clock Miracle or The Storm That Stopped. 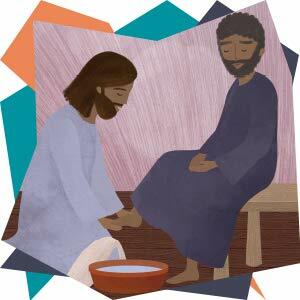 The recent The Friend Who Forgives is about grace, based on a parable from Jesus. We loved God’s Very Good Idea which shows God’s plan for ethnic and other kinds of diversity in creation, and how God’s plan of redemption includes restoring multi-ethnic reconciliation, never wavering from his “very good” plan. It’s a delight that share the whole gospel — what Lisa Sharon Harper on her adult book calls The Very Good Gospel. Echeveri did a Good Friday-themed one in this “Tales That Tell the Truth” series called The Garden, The Curtain and the Cross. It’s very good and would make a great Easter gift. The new one is also about death and resurrection and it interestingly gets at that by starting with the story of Lazarus, and what it means to lose friends. It is a great tool to help explain sickness and death to children. In a theologically robust way it is reminding us that in the resurrection of Jesus, we don’t have to say ultimate goodbyes any more. As Chandler has Jesus saying, “There is a day coming when we will say goodbye to saying goodbyes forever. Do you believe that?” I suspect she used this Biblical story in her own family teaching her children about the frightening news that her husband had a brain tumor. I am glad for this good, good resource. 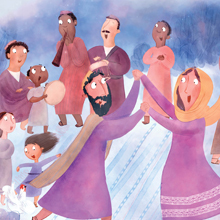 As it says on the back cover, “This is happy, and sad, and (in the end) very happy story of what happened when Jesus visited his friends Mary, Martha, and Lazarus, and changed everything.” Kudos to the whimsical illustrations, the portrayal of people from many ethnicities, energetic illustration that captures the spicy flavor of Middle Eastern culture, and the glimpse to contemporary times. The Lion, the Witch and the Wardrobe the Crucifixion and Resurrection. Prince Caspian restoration of the true religion after corruption. The Horse and His Boy the calling and conversion of a heathen. 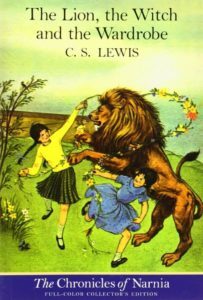 The Voyage of the “Dawn Treader” the spiritual life (specially in Reepicheep). The Silver Chair the continuing war with the powers of darkness. The Last Battle the coming of the Antichrist (the Ape), the end of the world and the Last Judgement. There are a few different covers and boxed sets available. It’s a little complicated. We favor the ones that show the original artwork by Pauline Baynes, but that have been colorized with soft pastel color. The 1950s original illustrations were black and white sketches, and the editions that have those are on cheaper paper and not nearly as nice. The colorized paperback editions, however, have a heavier stock glossier paper and are bound nicely. The cheaper paperback editions have nice covers by Chris Van Allsberg but the Pauline Barnes inside art is black and white; they sell for $8.99 each or $55.93 for a boxed set. The nicer paperbacks with better paper and colorized Pauline Baynes art sell for $9.99 or $8.99 each (depending which book) or $64.99 for a boxed set. 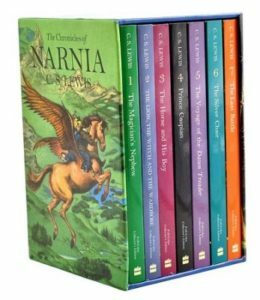 The hardbacks sell for $17.99 each (or $120.00 for a boxed set.) The cover art is by 2-time Caldecott medalist David Wiesner and interior illustrations are Pauline Baynes originals. As you may note from the list above, the order of the books, nowadays, as per the wishes of the muckety-mucks at Harper, starts with The Magician’s Nephew, now labeled as Book One. 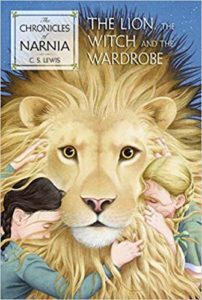 As most older readers know, The Lion Witch and the Wardrobe remains the one that should be read first. It makes a great Easter basket present! 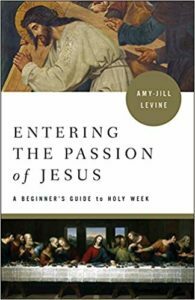 Entering the Passion of Jesus: A Beginner’s Guide to Holy Week Amy-Jill Levine (Abingdon Press) $16.99 You may recall my review of this at the start of Lent… it isn’t written as a daily Lenten devotional, so I was surprised how many people ordered it from us a month ago. I wanted to mention it again since its six chapters would make a great reading plan for Holy Week. It’s just 141 pages and a very good read! And that’s a good place to start a re-telling of the passion of Jesus, no? Entering the Passion… offers good scholarship, a bit of cultural and religious and political context, and a narrative that pushes us to wonder what all this matters for today. For those of us who do want to follow Jesus, who see ourselves as part of his Body, the church, this will be a blessing and a challenge. What does it mean to take risks to fulfill our calling, to be a loving servant of others? There are deeply spiritual and frankly ethical questions that Levine unearths from these classic gospel texts. 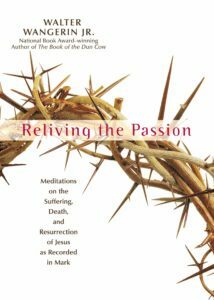 Reliving the Passion: Meditations on the Suffering, Death, and Resurrection of Jesus as Record in Mark Walter Wangerin, Jr. (Zondervan) $14.99 Oh my, this is one of the best Lenten books we know, a careful and moving reflection on Mark’s telling of the passion week story. This offers 41 readings for the season but you could obviously just read the last few weeks as it moves towards Good Friday and Holy Saturday. This is a hand-sized, compact hardcover and Wangerin is a great storyteller and accomplished wordsmith. Highly recommended. 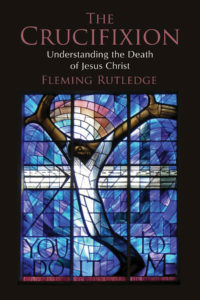 The Undoing of Death Fleming Rutledge (Eerdmans) $24.00 I have described this in better detail other years — almost every year since I was blown away by it in 2003, I believe. If you enjoyed her Advent sermons you will appreciate these as well. These are not Lenten sermons generally, but many year’s worth of Holy Week messages — Palm Sunday sermons, Maundy Thursday reflections, Good Friday words, good, good stuff on Holy Saturday, Easter sermons. This is mature, eloquent, moving, inspiring, collection of real sermons preached by this legendary Episcopal priest. For some chapters there are some art pieces shown on which she helpfully comments. I commend this book to you with all my heart. 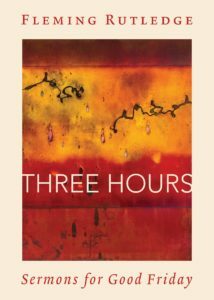 Three Hours: Sermons for Good Friday Fleming Rutledge (Eerdmans) $18.00 Last year, Reverend Rutledge preached seven sermons in a three hour Good Friday sermon. She has published several such sermons in The Undoing of Death and again in the nice little paperback, The Seven Last Words from the Cross but three are fresh and new and powerful and they cohere well. The book is a compact, thin hardback and is just lovely, a treasure to have and to hold and to share. I hate to sound pushy, but you will benefit from this, and it is a great little volume. Yes! The Day the Revolution Began: Reconsidering the Meaning of Jesus’s Crucifixion N.T. 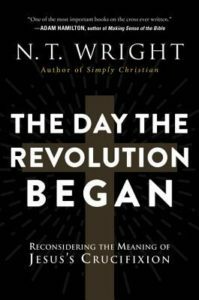 Wright (HarperOne) $18.99 You know we are fans of Tom Wright and we appreciate his careful and lively exegesis framed by a big Kingdom vision. This is Bible exploration for the sake of the churches mission, which itself is for the sake of the world — thanks be to God! As I explained when this came out in hardcover a year or so ago, we might describe this as a study of the cross in light of Wright’s essential book Surprised by Hope. That is, if God’s final agenda is not to whisk us away to some heavenly place beyond the clouds but is, in promissory fashion, restoring the good but fallen world into a (re)new(ed) creation then — with that big restoration/creation-regained project in mind –what is the point of the cross? Wright her looks through the lens of new creation and cosmic restoration at every key passage where the apostle Paul writes about the cross. What is going on in these passages? How might we more fully understand Paul’s insistence that Jesus puts to death, Death? Is it proper to refer to Good Friday as the start of the revolution? I dare you to read this book and not feel your mind stimulated, your heart inspired, and your feet and hands ready to get back to work on Monday morning. The Suffering and Victorious Christ: Toward a More Compassionate Christology Richard Mouw and Douglas A. Sweeney, with an afterword by Willie James Jennings (Eerdmans) $19.99 In the last BookNotes blog newsletter I highlighted a fabulous, readable, conversational rumination on evangelical theology called Restless Faith by Richard J. Mouw. I noted how widely read and conversant he is in many faith traditions, how he is generous in taking seriously the proposals and insights of those outside of his own Reformed camp, and is a good conversation partner, learning and growing from others as he seeks theological (and social) common ground. I might have said that he is restless not in an itchy or cynical way, but in a generous sort of open way, always eager to reform, to mature, to give an account for stuff we learn as we live in God’s world. And so, this little volume is a perfect example of that. It is a bit heady at times, but mostly is a moving bit of theological reflection on how the suffering of others helps us more fully understand God, the nature of Christ, and the work of the cross. He and Sweeney (a professor of the history of Christian thought and chair of the church history department at Trinity Evangelical Divinity School) here point us towards “divine empathy” where the incarnate Christ suffers with his fellow humans. We began to think about writing this book after presenting papers together at a conference held at Tokyo Christian University…We joined with eight other scholars — from Japan, Korean, Britain, Australia, and the United States — to explore what we could learn from one another about pain and suffering, victory and hope, as they relate to the significance of Jesus Christ in our globalizing and pluralistic world. We wanted to play from our strengths and work with familiar resources, so we turned our our respective theological traditions for guidance toward amore global and compassionate Christology. They realize, though, that in North America, there have been those that have given voice to these themes. They look at the Lutheran and Reformed traditions — including Lutheran Franz Pieper as well as John Williamson Nevin of (central Pennsylvania, German-Reformed, Mercersburg fame! And they look at the black church, especially, which has, as a church of enslaved and oppressed persons, had to do their theology in light of the pain and struggle of the people. Their articulation of victory and hope is deeply connected to wounds and trauma. So here, a white Reformed and a white Lutheran scholar look to the likes of Sojourner Truth and other theologies of enslaved persons. After these reflections on incarnation and suffering and Christ’s empathy as a corrective to others sorts of images of Christ’s work, there is the chapter called “The Challenge of Application: Christus Dolor in the American South.” It is important reading here in the sad year of our Lord 2019 when (as we learned this week) iconic civil rights sites like the Highlander Center are defaced with white supremacy symbols and burned to the ground. 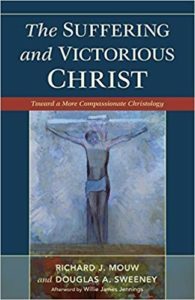 There is a remarkable essay at the end of The Suffering and Victorious Christ by brilliant black scholar Willie James Jennings called “Christus Victor and Christus Dolor: An Afterword.” Mouw, Sweeney and Jennings? Wow. 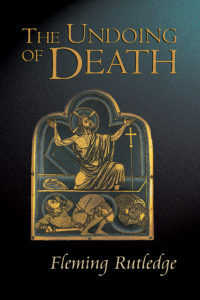 This may not be everybody’s sort of Holy Week reading, but for some of our customers, this book is a must. 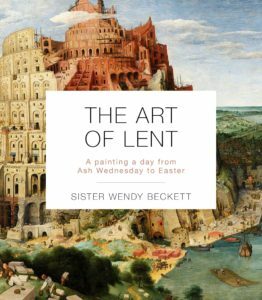 The Art of Lent: A Painting a Day from Ash Wednesday to Easter Sister Wendy Beckett (SPCK) $15.00 This little book, wonderfully printed on heavy paper and full color reproduction, at such a nice price, is, I’ve often said, the best bargain of any book published in recent years. What a great resource this is — so nicely done (if, granted, a bit small.) Okay, so you missed the wonderful opportunity to use this for the last 30 days. You can use it this next week or so, and I am sure you’ll draw on it over and over. We sold a lot of this one last year, and some have re-ordered. Some who loved the Advent one got the Lent on (a “no-brainer” somebody said.) We’re happy to remind you of it again. Get it now, on sale.